In the 16th century spirituality in europe had a revival through the influences of asain travellers and the influences of the masters. This era was marked by an intense discourse on religious and denominational problems. Almost in time, the heliocentric world view of Copernicus was explained by the Roman church to the heretical heresy. Therefore secrecy was an important factor for success - still until today. In the century before the 22 tarotcards had been published in an immature condition with respect to the symbolism. Between 1614 and 1616, two anonymous manifestos were published. On the Confessio Fraternitatis (The Confession of the Brotherhood of RC) followed the Fama Fraternitatis RC (The Fame of the Brotherhood of RC) . In several countries other rosicrucian authors published their books with symbolic descriptions of the path. The "Einfältig ABC-Büchlein" of the rosicrucians and Speculum Sophicum Rhodo-Stauroticum of Daniel Mögling (1596–1635) are only examples. The leading rosicrucian member at that time was Johann Valentin Andreae. He published three major books (the authorship is not quite clear). The Fama describes the 18 steps to enlightenment in a symbolic language together with formulas of the quabbala. The Fama is actually an extract from the work of the Italian satiricalist Traiano Boccalini, originally published in Venice in 1612, which contained a description of an imaginary kingdom for the purpose of criticizing the customs of his time. The theosophical south Tyrolean writer Adam Haslmayer was already in possession of a copy of the Fama in 1610. He praised it in 1612 against some german princes and distanced himself from the church. In 1612 he was therefore condemned to a five-year galleys panelty in Genoa, after which he fled to Augsburg in south germany. The Fama demanded a reform of science, religion, culture and society. The ethical management of life with the rapid advances of the sciences and the associated technical possibilities had remained far behind. * The chymical wedding - 1616 [ PDF];[PDF2]; The seven initiations - step 15 to 22 of the universal path. This alchemic 'travel to the marriage of the king' describes the seven higher initiations inclusive step 22 of the Universal Path. It begins when the "Virgin" visits Christian Rosenkreutz (Christian Rose Cross) in his small house at a mountain[ Mountain : symbol of uplift high into the divine; house : symbol of the logos or Shabda] while he was in 'deep meditation'. This woman symbolizes the sate of the soul at "Venus"-Phase at the end of step 14.2 of the Universal PATH. The manifestos directly state: "We speak unto you by parables, but would willingly bring you to the right, simple, easy, and ingenuous exposition, understanding, declaration, and knowledge of all secrets." They are not taken literally but rather regarded either as hoaxes or as allegorical statements. 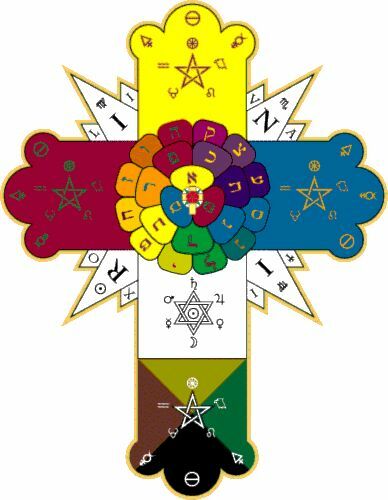 The traditional rosicrucian brothership has never been on a magic path, but it has always been a spiritual brothership(with relation to the white brothership). In the following centuries a number of occult societies were attached to the rosicrucianism and several commenting books appeared.